Has any cash moved at this point in time? Have we paid the telephone bill yet? The answer is no. In fact, our assets do not change at all at this point. The telephone bill is an expense – it is an event that results in money flowing out of the business immediately or at a later date. The expense (event) has occurred – the telephone has been used in April. In this case, the money that will flow as a result of this expense will flow out at a later point in time. This is not a cash expense, but rather an accrued expense. Remember that according to the accrual system, we record the expense when it occurs, not later on when cash is paid. As the bill is owing, we add the value of this bill ($200) to our liabilities. This liability is not a loan, but it is a liability. This liability of $200 is included under creditors. Expenses are the opposite of income. More income means more profit, which goes to the owner and increases his share. More expenses (or expenses simply occurring), mean less share for the owner. The expense occurring means that the owner’s equity decreases. The owner’s stake in the assets of the business decreases by $200 to $25,800. The external parties’ stake in the assets of the business (i.e. liabilities) increases by $200 to $5,200. Remember, if you're stuck or confused with a concept as you go along, go back a step or two (or even more ) to where you were last doing well. Check over and see what you didn't quite get the first time, clear it up and move on. 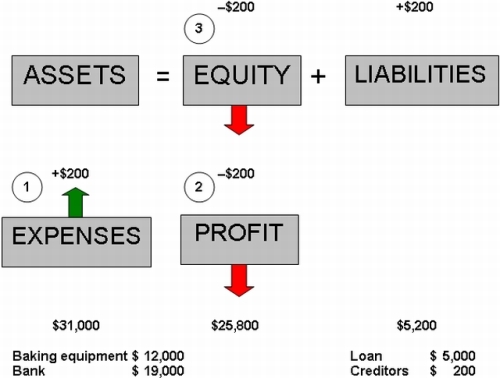 If you're confused with the above lesson, check out our earlier cash expense example in the lesson entitled Define Expenses (for an easier example of expenses), or the lesson Accrued Income, where you can review how the accrual basis of accounting works. What is the Difference between Accrued Income and Accrued Expenses?